***All necessary cables are included. As always, we will provide you with step-by-step instructions to set up your rental gear. We can even color-code and draw you a diagram to help you out. Our goal is to make this the easiest part of your special event! Also, keep in mind that the equipment shown is a suggestion based on our experiences, and is subject to change based on availability. If there are any changes or additions you would like to make, we will be happy to accommodate. 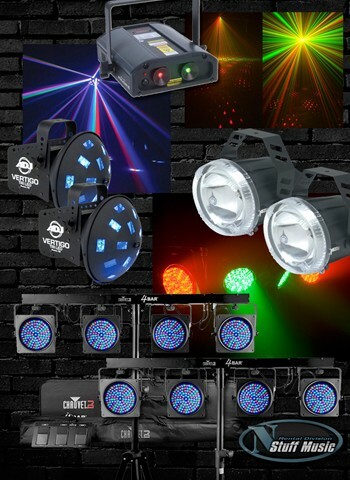 DJ Lighting Package 1 is a great place to start if you would like an introduction to the world of lighting. 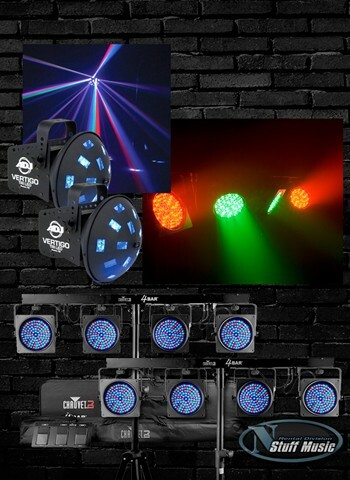 The DJ Package 1 includes 2 Chauvet 4 BarUSB- which can be run either by wireless foot switch (included), by DMX controller, or they can be sound-activated. The Chauvet 4 BarUSB is an excellent cross of wash- and effect-lighting.